I stopped off at my local patchwork store today and grabbed myself some luscious fabric. 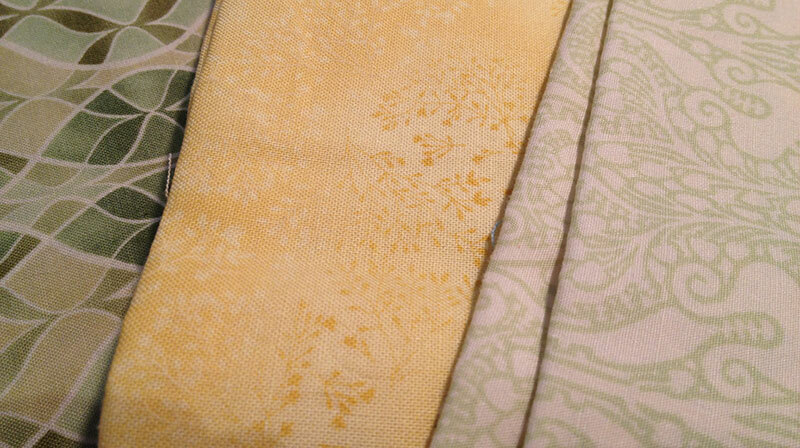 I grabbed four fabrics from the Mint Collection Down Under collection. I’ve had my eye on these pieces for a while now. I am having a bit of an obsession with grays and there was something about this collection that just shouted out to me with its pops of yellow and turquoise. Now I am not a yellow fan. In fact, I used to openly say that yellow was probably the one colour that I detested. But as I get older I find that I am liking it more and more, which is a little worrying to me because I have nothing in my house that will go with yellow. 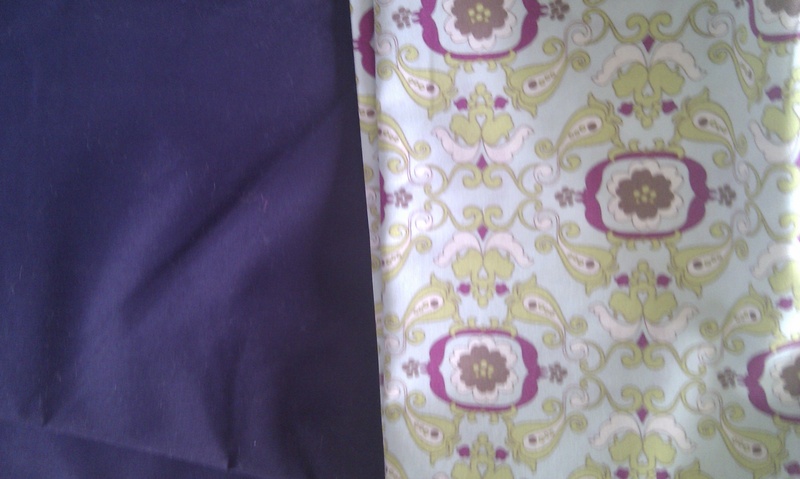 But, I saw this fabric and fell in love with it. The four corner pieces are from the Down Under Collection. 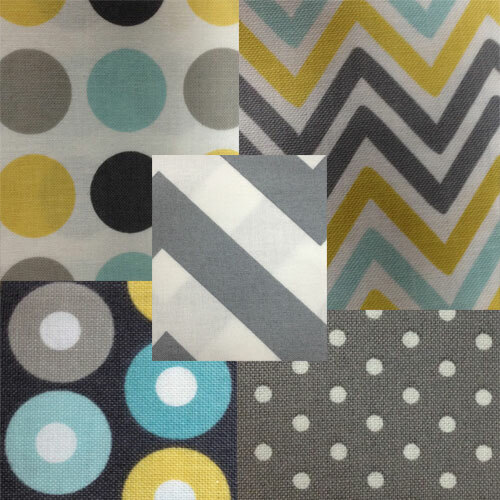 The top one is a gorgeous grey chevron. Now my dilemma. WHAT pattern am I going to use to create fantabulous cushions? I would ideally like to combine these fabrics with splashes of white and perhaps a little more yellow (omg here comes more yellow!). I have gone through Moda Bakeshop and Elizabeth Hartman’s quilt book, but I just can’t seem to find the right pattern. Any ideas? Something simple. And square. I admit, I’m truly stuck. Wow this has been a super busy week. I would love to say that I’ve been relaxing in front of the TV or reading a good book or just casually making progress on my Rain or Shine quilt, but none of that is the truth. I came home from work last Thursday night having just read that Toni from make it perfect was going to be starting an auction to raise money for the Queensland flood victims. So I quickly came up with a very simple design for a quilt (a disappearing nine patch quilt, cut up, rearranged and sewn back up to create a new pattern – very funky), hunted down some fabric fat packs that I had been saving for a quilt that I might one day make and started cutting. That was mistake number one. I just totally went in gung-ho. Did I stop at any point to measure up my fabric, to perhaps work out how many squares I would need to cut to create the whole layout, to work out how big to make the original squares for the nine patch? Of course I bloody well didn’t. That would have made sense. So I cut out all my fabric, leaving one flat fat of each, for just in case, or for future use (because I really did love that fabric) and started sewing up my squares. 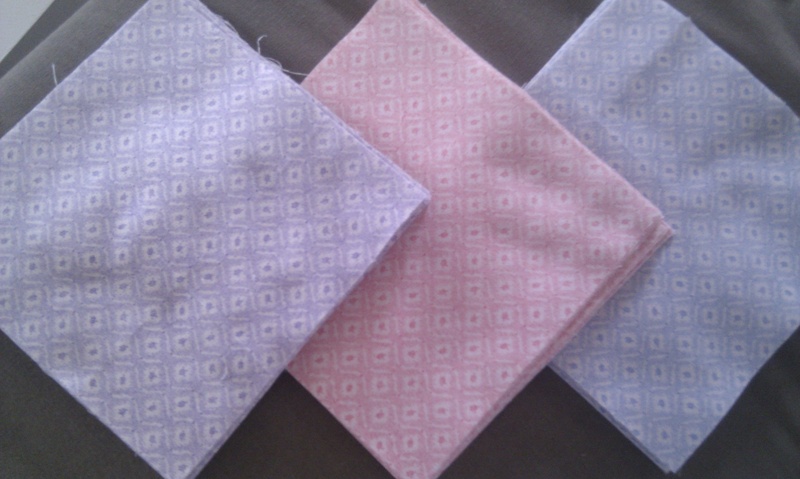 Then I cut the squares, then I sewed them back up again. 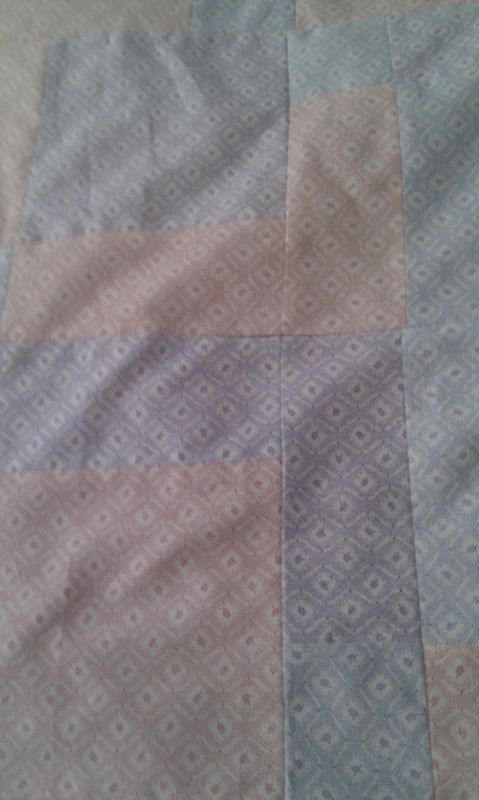 That’s when I realised that oh dear… I wasn’t going to have enough squares to make the whole quilt. So that’s when mistake number two comes up. I cut into the last of the blue flat fats that I had. Again with the not measuring… Will I ever learn? (Well yes, I have now learnt my lesson – believe me). I align the edges of my last fat of fabric and start cutting the squares when I realise that SH*T I am ONE, yes only ONE square short. 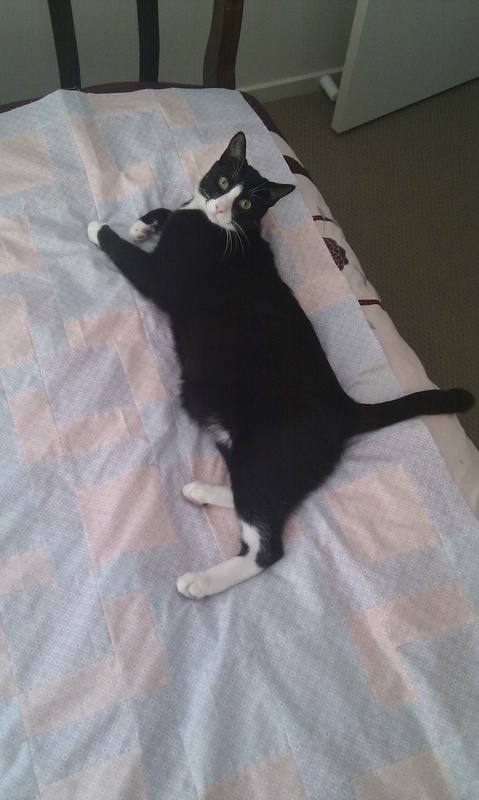 At that point, about 11.30pm on Thursday I threw all the fabric down and stormed off to bed. I was not happy with myself. Friday rolls around, and we had a wedding to go to, but Mick – being the wonderful man that he is – spent some of our precious shopping time taking me to a couple of different fabric stores, hoping that I could still get a couple of the flat fats to match. Alas, I was out of luck. I toyed with the idea of buying new fabric for it, but there was too much to choose from and we were running very short on time before the wedding. So off we go to the wedding – absolutely gorgeous – and out went all thoughts of quilting from my head. Or so I thought, but about halfway through the ceremony, right about the time the I do’s were being said, I realised that I would have enough fabric if I pulled everything apart and cut all my squares down from 6inches to 5inches. Such a simple idea, that took so long to come up with. Finally something was going right. 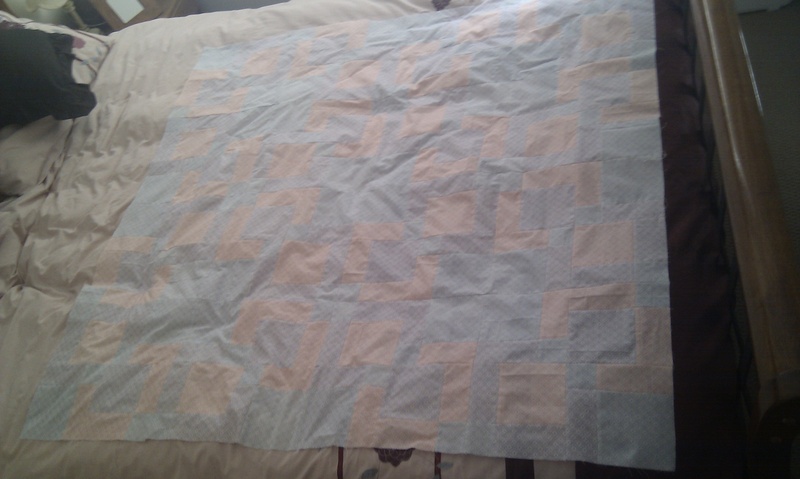 I sat down on Saturday morning, started trimming all my squares and re-sewing them till at last the top was finished. 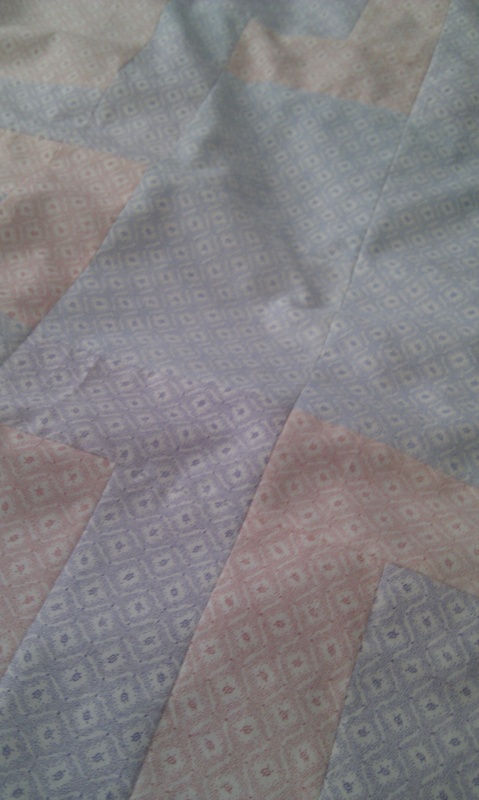 And those one inch strips came in very handy to do a pretty detail for the back of the quilt. I would love to say that I managed to finish the quilt and get it up online in time for the auction, but as I’m sure you can see, there are no posts below with details of a quilt for sale. No people, it’s still not finished. With all my stuffing around (my own fault, dumbarse that I am), and with the unexpected arrival of Mick’s daughter Miss Snotface (xoxo) and Mum2 (Mick’s mum) who both decided to stay for a few days I didn’t get anymore sewing done. 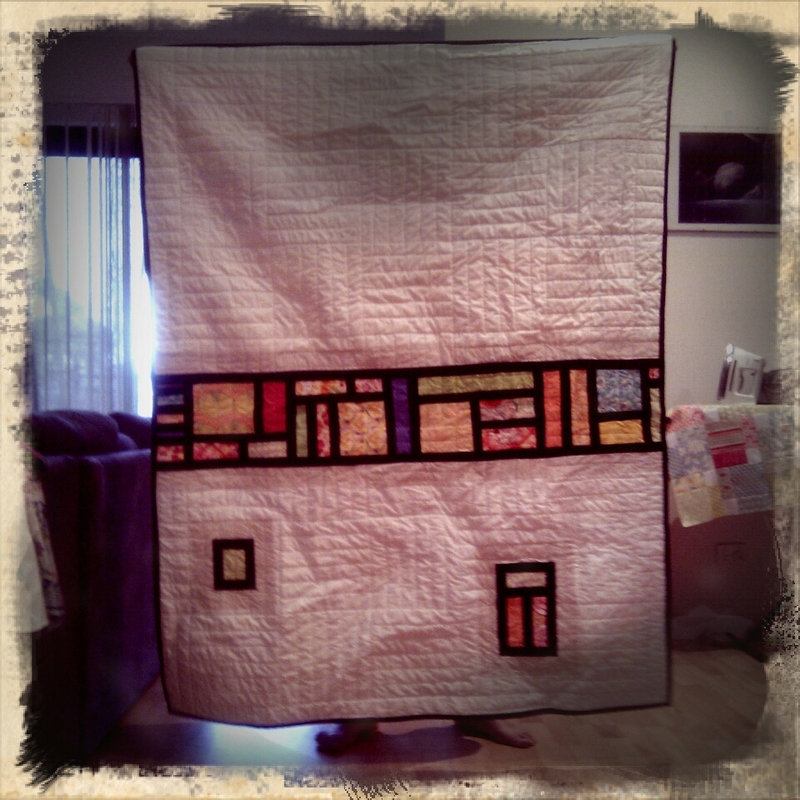 So if anyone is interested, this is the quilt that was supposed to be in the auction. 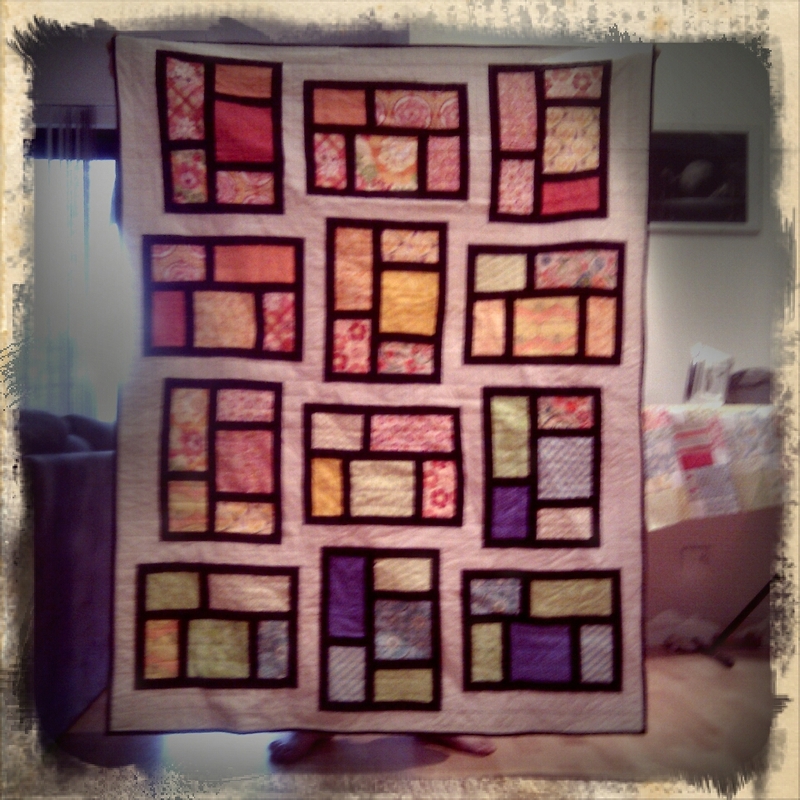 I would still love to auction it off for the flood relief, but feel a bit weird selling off an unfinished quilt. Maybe I will see if I can donate it to someone up there instead once it’s finished (this weekend hopefully *touch wood*). Does anyone know of any quilt drives happening? 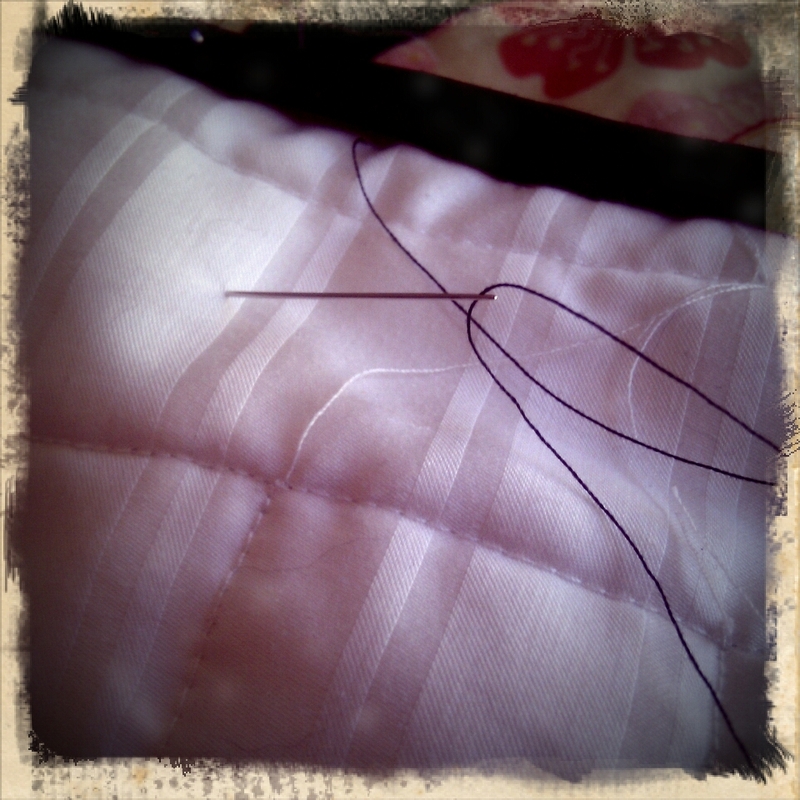 So that is the story of my rather fuddled way of making a quilt. Note to self (and anyone else out there who would like to listen) Measure twice (or three or four times) and cut once. Yes, I should have listened to my woodwork teacher years ago. It really applies to quilting – who’d have thought. Oh and please everyone, if you haven’t already, head over to make it perfect and bid on some fantastic items. Maybe a bit of sewing this weekend? Posted on November 12, 2010 Leave a comment on Maybe a bit of sewing this weekend? I admit it. My life has been taken over by writing lately. Trying to write my “greatest story ever” for NaNoWriMo and making sure that I post here every day for NaBloPoMo, even though sometimes there just doesn’t seem a point to it – blogging for the sake of blogging has never really sat well with me, so I’m a bit miffed with myself for doing just that – so here I sit tonight, with a very sore wrist and sore fingers from all the typing I’ve been doing and a sore head from all the thinking, planning and plotting I have had to do to get my story going somewhere (12,327 words so far – still a long way off 50,000), so I’ve decided that this weekend is going to require a little sewing relaxation to get my brain back into gear. 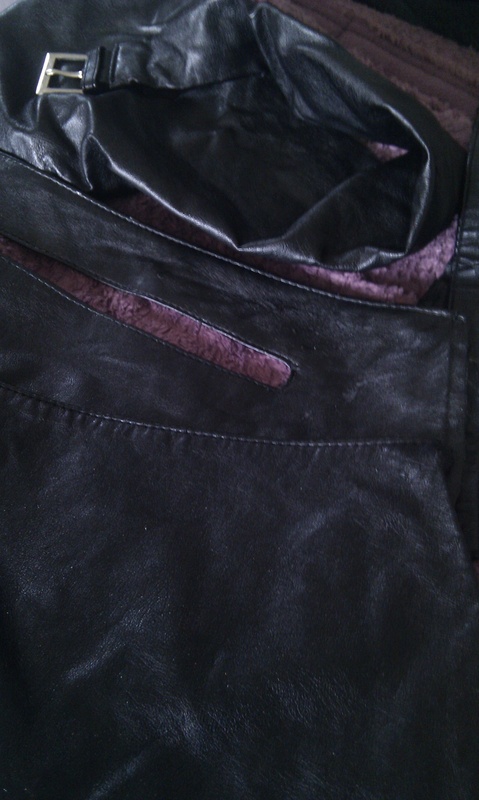 A few weeks ago one of my favourite all time slouch bags started falling apart. 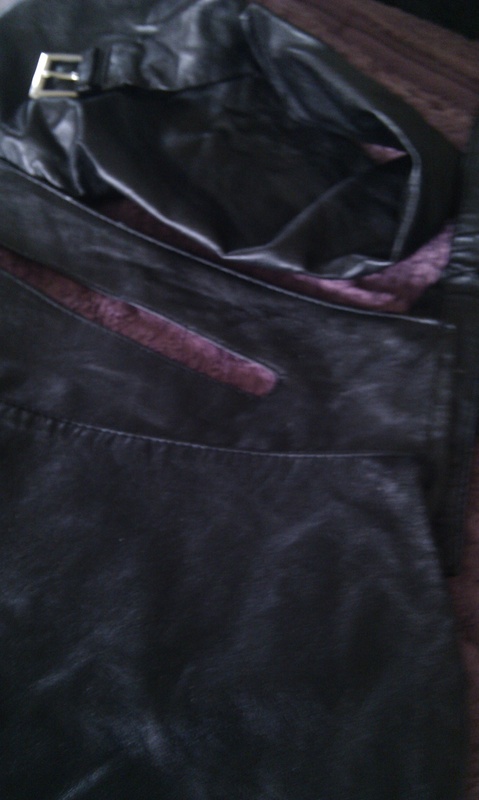 I’ve had this bag for so long and it just had the perfect length strap, the perfect inside, it was the perfect bag. I was quite upset when it started falling apart, but I kept using it, until the stitching actually started coming away from the handles. It was at that point that I realised I couldn’t keep using it. So I ripped it apart at the seams and decided to make my own bag using the pieces. I’ve never done this before, so I’m hoping it’s not going to be too hard, but I figure if I can make clothes and jeans, I should be okay with a bag. Cross fingers for me and I’ll let you know how it goes.